Sets need to be somehow improved/redone for being more useful than character fully equiped with low-mid tier crafts. It'll be possible to do in Sigma with ability to make any item being locked to one character so noone exxcept certain build would be able to use set parts. And i think they need some unique stats for build they done for. Some examples: full bowzon set may add pierce to dragonlore skill that scaling with baselevel (instead of -all resist currently) or smth like "wyrmshot fires missiles 25-50% faster". Melee necro set could have bonesplitter transformable into spirit edge and improve deathlord morph by adding there some skill IAS scaling with hard points (to compensate bonesplitter slowpoke attack speed and make it easier to reach last breakpoint) and adding extra 1% more base block chance at some base skill lvl (10/15/20) to make it more viable to put hard points in it while making choise between scythe and dagger less obvious (me personally almost never using scythe anymore after attack speed nerf since daggers can provide nearly same damage while being much faster)..
Light sorc set can simply double avoid from warp armor (currently you not able to get more than around 20% AFAIK... if not uber-end-game with Khanduran, upgraded Laz, all charms and so on) and/or double tempest bolts. Cold set (currently cold sorc is least useful of all existing) is already good at defence stats but still ice bolt nova is not good enough for being good further than a5 terror.. it could alter/improve abyss somehow. or even ice elementals since now they're more offensive than defensive. Frozen orb is the best skill i ever play on any rpg game. it just doesn't fit into median's gameplay. median moves way too fast for a skill like that to be used effectively and its old. there's very few things, if any, that came from classic d2 and remained the same way into median. I even followed the suggestion to look for the banner at the entrance and draw a line and head in that direction but still didnt find it. Also, since we end up collecting around 40 charms, perhaps a charm bag or a way to transmute finished charms into one or more megacharms? say 4 charrms fits into one. Visit Ureh few more times and if it still will be overwhelming then come back with that idea but im sure you will just smile while remembering it gave you any problem at all. casually1987 wrote: Also, since we end up collecting around 40 charms, perhaps a charm bag or a way to transmute finished charms into one or more megacharms? say 4 charrms fits into one. Current character inventory size is 10x8 tiles and latest screenshots posted by whist are 15x10 tiles as you can see below. Add: 15x10 tiles size confirmed with Sigma trailer. so we have almost twice as much inventory space. (150 vs 80) that's nice and all but if we have 40 charms that already knocks off 40 squares (110 new setup vs 40 current setup) . I'm still wondering if there are ways to compress charms/jewels/runes/ other things we might want to pickup just because the idea of running out of space is very frustrating for multiplayer games. I know this teaches us how to think but it would still be a nice feature to have. Something similar to the way we can cube shrines to stack them on top of each other would be great, maybe that wouldnt work for jewels so perhaps we could get a jewel/ gem bag/ or a rune bag or something? I can imagine with all the elemental runes and potentially more awesome changes that might be coming down the road we should think of the future and how are we going to store all the great stuff we find? No worry, just gave you info to keep you up-to-date with whats coming. Sure, im positive for any 'Quality of Life' changes, but dealing with inventory management (aka hoarding issue) isnt top of my list. Dont get me wrong, its not criticism targeted at you. 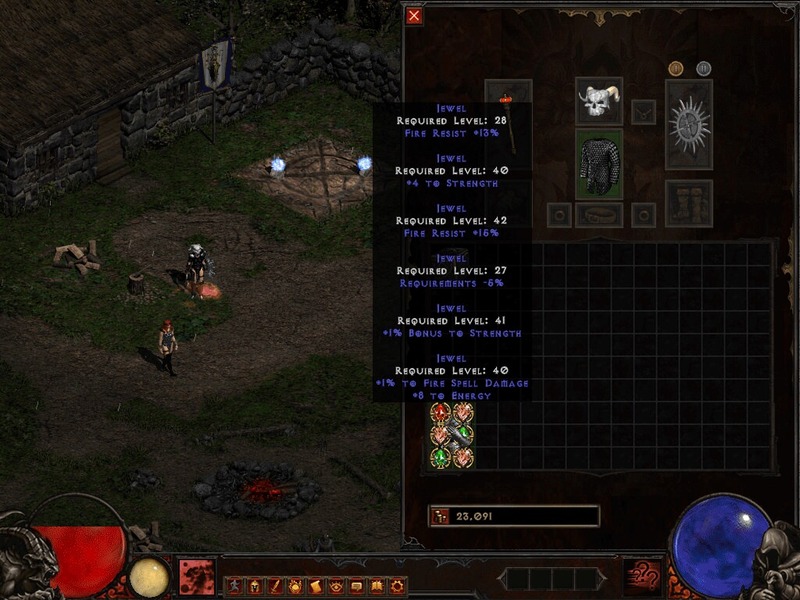 Diablo II was always game where we was hunting for better gear, heavy farming but in fact it wasnt necessary for good game experience, funny example was UT Smiter dedicated for ladders with gear worth of near three Ists and was working perfect (even better with Life Tap charges Knife). Now to the point, I will be more happy if Sigma changes will make your time spent ingame a better adventure than pixel hoarding simulator of items that you will probably never use and delete at the end of the ladder. Of course keep coming with ideas, its always good when players share what they expect from the game, maybe some of your suggestions will find a way to the game. Cheers. Yeah and I'll take anything I can get space wise. Almost doubling the space is a huge improvement and I'm sure the stash is much bigger as well. I'm glad to see the game is evolving and growing, especially since new content tends to bring new drops and things to collect, therefore a need for more space would be desired. I try not to be a hoarder but at the same time some guides recommend having 2 sets of gear so you can shrine bless one and then bless the other to see which one gets better stats. plus i play a stormcaller javazon so i need to switch gears and specs for some ubers. - hence the space issue is a concern for me. Still, its a great improvement so good work everyone.